Alta Window Cleaning was established in 2013 by Genaro Guzman. Alta Window Cleaning, Las Vegas specializes in residential window cleaning service in the Las Vegas Nv Area. We are highly trained to give you the best results, and we have the 5 star reviews to show it. We don’t rush through your home as fast as we can in order to get to another job. Rather we take the time to get your windows looking great the first time. Alta Window Cleaning prides itself to deliver personalized service from start to finish to all clients. We are Las Vegas most trusted, reliable and dependable window cleaning service. We are licensed and insured for your peace of mind. Call us today to get your personalized quote. We offer professional window cleaning, gutter cleaning, chandelier cleaning & pressure washing services throughout Las Vegas, Summerlin, Sun City Summerlin, The Lakes, Anthem, Henderson, Centennial, Blue Diamond, Rhodes Ranch and Silverstone Ranch Nv. Call us today for a free quotation! Genaro was wonderful and did a fantastic job cleaning my exterior windows. I found him on Yelp and contacted him through the messaging service. His response time was really fast and he was able to come by later that day and give me a quote. He was friendly, professional, and the price was really reasonable. My windows have never looked better! I would definitely use him again in the future. This is an outstanding person that is very respectful of your home and does an absolutely awesome job. He is a family man with 3 children and just CARES about what he is doing. Don't hesitate give him a call if you need your windows done. Priced right!!!! We had not been able to find someone to wash our windows and they were really dirty. Genaro came today and did our windows inside and out and they are sparkling clean. He arrived right on time and did the windows in the time he said and his price was very fair. I would recommend him to anyone. We plan to have our windows washed on a regular basis. Genaro did a great job on my mom's house in Sun City. He was fast and efficient at a good price. The windows have not looked this good in years. I definitely recommend him. 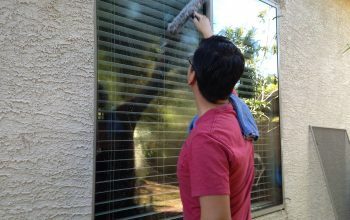 We offer professional window cleaning, gutter cleaning, chandelier cleaning & pressure washing services throughout Las Vegas, Summerlin, Sun City Summerlin, The Lakes, Anthem, Henderson, Centennial, Blue Diamond, Rhodes Ranch and Silverstone Ranch.